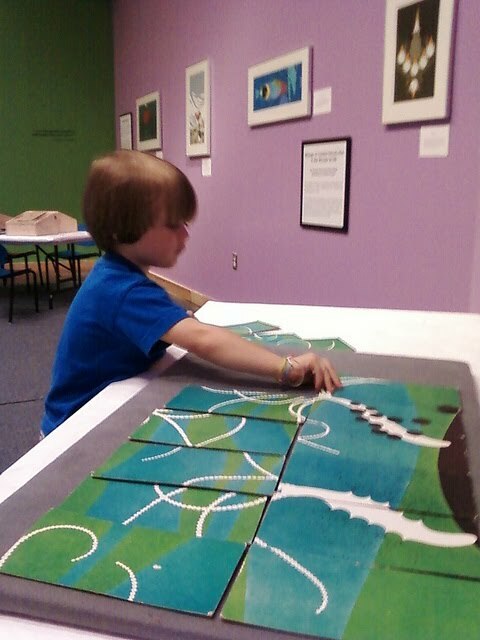 Noodle & I swung over to CMoR today to take in the just-opened Charley Harper exhibit. Beguiled by the Wild is on loan from the Virginia Living Museum and on display through October 15th. But I have no idea how you'd know that since the museum has done little to hype what could be a really great asset to their representation of the facility as a "museum" and not as a playground. I found out about the exhibit quite by accident while nosing around the register as I was waiting for someone to check us in last week. Even within CMoR itself, there are no signs advertising the event. Seriously, none of the parents I spoke with at CMoR today had any idea the Harper show is currently hanging in a room just off the main lobby of the museum. Which is such a shame....especially in a city that houses a renowned art school. VCU's graphic design students should be required to view the show, but I doubt they even know it is in town. The Dude and I were the only folks in the room for extended periods of time during each of our visits to the exhibit today. Which was great for us, but really just made me bummed out because the collection is really cool and nobody is seeing it. Noodle definitely dug the art and had a story to tell about each piece he viewed. 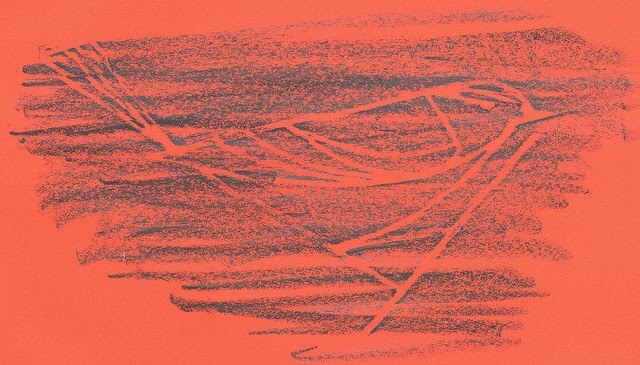 Harper's minimal realism translates well with children, who also seem to share his innate ability to simplify the complex in their own art. 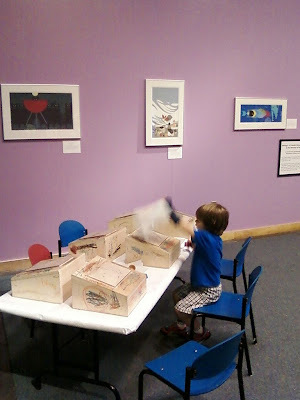 The exhibit's interactive art stations make the experience more child friendly and the art easier to discuss with younger children. See the otter? What shape is his head? And his body? A rubbing station gives kids the chance to make their own Harper "prints" to take home and a tabletop filled with tangram pieces encourages young artists to make their own art using simple forms. 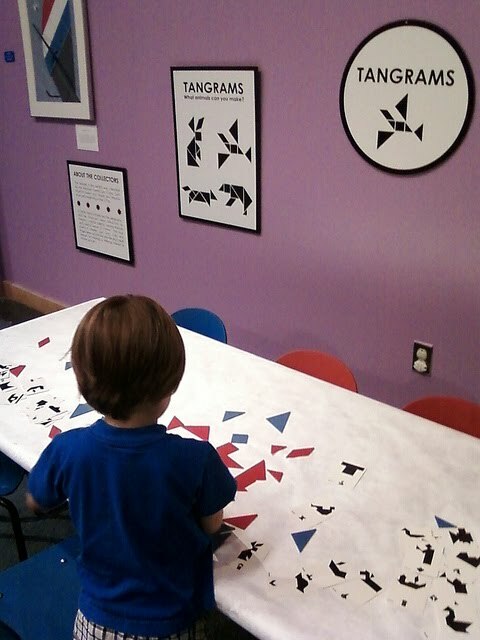 The Dude had a great time using the tangram pieces to recreate the animals in Harper's work and got frustrated as hell by the alphabet puzzle. 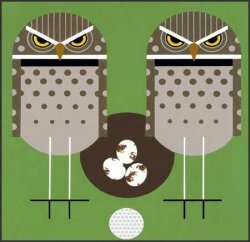 So, now you know about the Charley Harper show on display in Richmond. My job here is done. Please do yourself a favor and go see it. The Dude: (pondering the B&B Seafood Crab Shack on Williamsburg Rd.) Momma? Why do people eat crabs? Me: (gasp! finally! a vegetarian teaching moment! how do i handle this?) Well, because humans are at the top of the food chain. People can choose to eat animals or not to eat animals. The Dude: (peering up through his too-long bangs, head slightly tilted in full-on pondering mode) Oh. Mommy? I wanna eat a horse.